A partnership between Rodrigues Winery and a natural health company stands to bring two dozen jobs to the province and launch into European market. The end product will be a cranberry or blueberry drink using the sap's natural sweetness. "We've been trying to develop this business in Newfoundland for two or three years," said Semintha chairman Nicholas Katsepontes. "Finally, the market demand is increased to the extent we seem to have a fair bit of viability here and are getting orders." "What we do right now [making wine and spirits] will be dwarfed," he said, noting the contracts are already in place. "This is a slam dunk." "We are worried that such plans to start cutting lumber could spread and it is a very unique birch reserve Newfoundland has at Home Pond," he said. "There's gotta be a happy medium here where both companies can find a way to thrive." 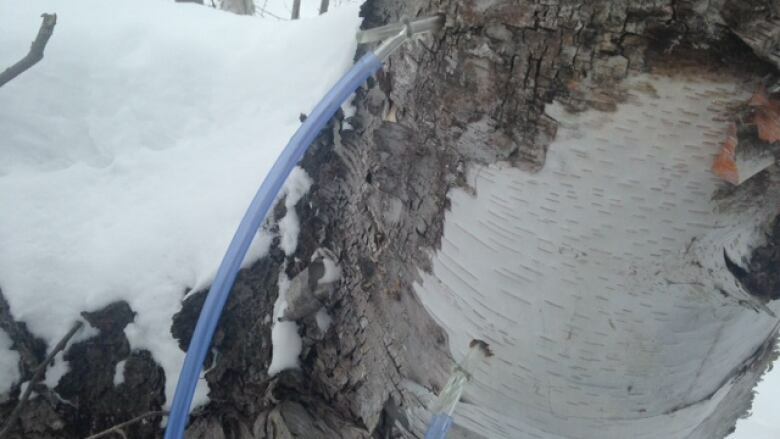 The value of a fallen birch tree is roughly equal to a year's worth of sap from the same tree, Katsepontes said, but the tree can produce sap for decades. "We see the forest as having far more value producing birch sap which can be turned into a variety of birch products, rather than cutting down that tree today." "We're looking at a traditional industry and actually coming up with something new out of it," Katsepontes said. "By looking at some of these natural resources and thinking out of the box a bit … There's some fairly remarkable potential there. We like to think we are on the cutting edge of that potential."